This weekend the international team were at the Bischofsheim for the 11th Rhein Main warm-up race, we also had the star appearance of the one of only pro mechanic Davey “Boy” Stanley ! Upon arrival Friday morning, the weather was great and the track was looking superb. The entire facility at the ESV is top level for presentation and effort. Friday is a day of practise for drivers, all of the Agama Buggies and Trucks were looking very settled on the surface and the BETA tires were hooking up well on the dusty green track. After the practise rounds we had Darren Seeded first in both Nitro Buggy with the A215SV and Electric Buggy with the A215E. Jon also first in Truck with the A215T, a great start to the event. On Saturday qualification started and was soon underway and was very successful for the team, with 12 of 15 rounds being TQ’d, a great achievement. The cars were very hooked up on the surface and all of the team were looking very comfortable. After qualifying in nitro we had Darren in 1st place, Burak Kilic in 3rd. 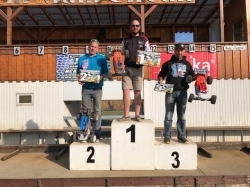 Berkan Kilic, Bart Mullink and Luca Kruger all qualified in great positions. In electric Darren also TQ’d with Burak 5th. In the truck class Jon Hazlewood drove impeccably to get the TQ. The finals were held on Sunday, with the TQ drivers they were directly placed into the main final. This meant Jon and Darren were both straight into the main, something that could be considered a disadvantage come the main final, but it is a guaranteed entry. The first of the 2 electric was up first in the afternoon, all of the agama’s got off to a good start and Darren was in the front of the field but there was a collision on the track that meant he dropped a few spaces back not allowing him to catch up to Jorn, ending up 3rd. In the next electric final, again some tough luck for Darren with someone landing on him after the first corner jump putting him at the back of the field, lap by lap he took chunks out of the time and pulled himself through the field but the 10 minute final was a touch too short and he brought it home in 2nd place. Burak also finished in 5th. The Truck main final was ran and Jon lined up first on the grid, he had a clean start and he soon started to pull away from the rest of the field. All of the pit stops were clean and the run was great, the truck looked very comfortable on the track. Jon finished 1st and Abdullah Kilic in a superb 3rd place. The Main Buggy final was a tough one for the team, Darren lined up first on the grid but there was a delay on the start and there was an unusual flameout from a low idle, which wouldn't have been an issue without the pause. This meant Darren was starting right from the back of the field and he was pushing hard, the car was looking very very quick and it was shown on the lap times, taking large chunks out of the leaders until another holdup, a collision in the pitman with another driver meant for a big delay not making the drive back the the front easy. Darren continued and brought it home in 6th place, the car was quick all weekend and the performance from all of the drivers has been great but this wasn't shown in the final results from buggy but that is racing and onto the next one. A massive thanks to the race organisers for a very enjoyable race meeting that we are honoured to be attending, we missed it last year when it wasn't on and we look forward to the next one. This weekend we are at KMRC for the second round of the RallyX national.